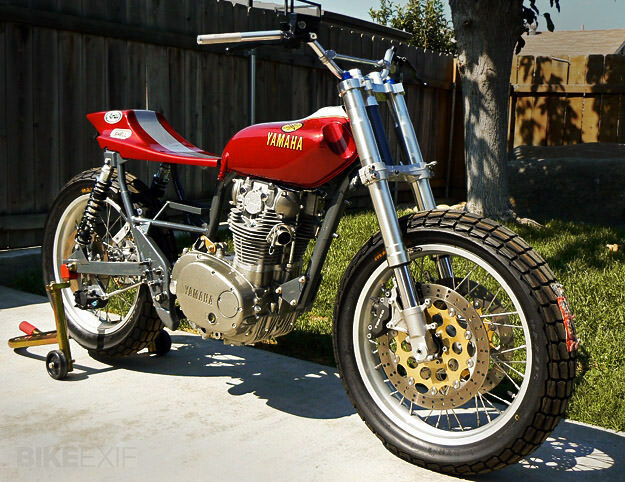 The king of street tracker style in the US is Mule Motorcycles‘ Richard Pollock. Right now he’s working on a Yamaha for a customer in Vancouver, Canada—and here’s a sneak preview. The project began as a request for a frame, but soon turned into an complete bike build. According to Richard, “It has all my normal frame mods, a Shell 750 kit and cam, valve springs and 34mm Mikuni carbys. The front hub is stock XS650 Yamaha, rear is a special 36-hole Barnes. We used GSX-R forks with stock lower clamp and calipers, then made a special top clamp to accept AFAM DT bars”.